[Event Background] Five classes of adepts of Star Lands always helping each other, but they have the same initiative. After some periods, each chief of adepts will form a Trial of Teamwork contest. Everybody challenge each class of adepts, and challenge the chief of adepts at last to show your power to the world. [Event Time] It will be held on every Monday, Wednesday, and Friday. 9:30 p.m. – 11 p.m. in Sacred Heart City. 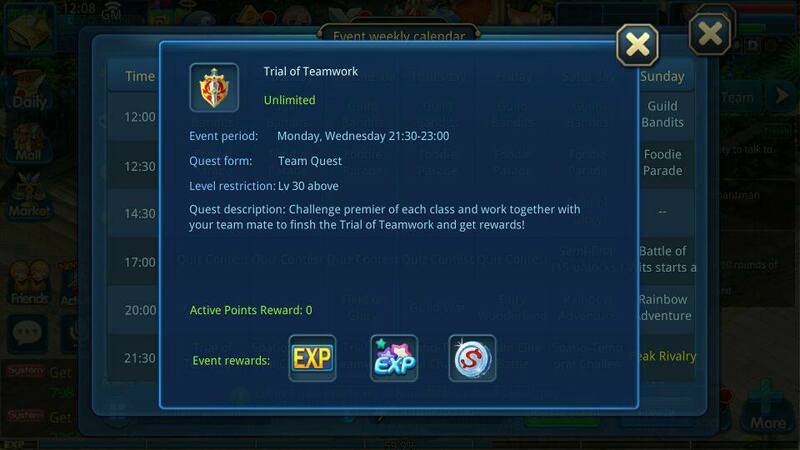 [Requirements of event] Characters with Lv 30 and above can join it in a team with at least 3 players. [Event Intro.] I. Team with at least 3 players can go find event Envoy to sign-up, sign-up successfully will be informed where players need to go to challenge Elite Adepts. Require to challenge the Chief of Adepts by defeating 5 Elite Adepts. II. Leader can choose the difficulty of challenge before battle, and difficulties have 3 levels. The lower the star level, the easier the battle. III. The ranking of event will be ranked on the basis of difficulty that leader chosen and the time using in battle. The higher the difficulty and the shorter of time using, the ranking will be forward. [Event Reward] In every Adepts challenge, there’s chance to get gems, 4-treasure, Beast Rivarly, great Exp and Silver rewards. After final, those first 3 teams will get title rewards. Players need to arrange a suitable formation to complete the event with high efficiency.